I grew up in Florida. Summers were hot. Really hot. Parking lots waved and shimmered before your eyes, things left in the car melted, and by 10 am you were ready to give up on any outdoor fun and retreat inside to the a/c. My family was lucky to have a place on the beach and we spent as much time as we could there during the hot summer months. It was still hot, but a good breeze and the water (despite being more bathtub hot than refreshing by the end of the summer) helped make those stifling days seem more bearable. Most of the time popsicles, in an assortment of bright, not-found-in-nature colors, were our preferred method of temperature regulation. But when company came to join us at the beach we always made homemade ice cream. Peach ice cream, a vanilla-base studded with fresh sliced peaches, was the house specialty. On those sweltering days, the ice cream maker would be dragged out of the shed and placed under the shade of the house. A wooden basket held ice and rock salt as well as the canister for the ice cream itself. Once assembled with the ingredients added, we twisted on the lid, plugged in the motor, and waited with anticipation as the ice cream maker hummed its way to my favorite summer treat. It’s no surprise that one of the first things I added to our registry when we got married over 7 years ago was an ice cream maker. My countertop model, cherry red and compact (no rock salt required), is a far-cry from the ice cream maker of my youth. Yet when I turn it on, the house filling with rumbling white noise, I still get that giddy feeling of anticipation. Over the years, I’ve made, and happily eaten, chocolate and strawberry and even red bean ice cream. They were all delicious, but about two years ago, I stumbled upon a recipe for vanilla ice cream in The Gourmet Cookbook. I tinkered with it, gradually deciding that it needed less sugar, and it has been my go-to recipe ever since. Spectacular on its own, more recently I’ve added dulce de leche to the mix and today, for a client who is craving her own return to childhood, I’ve added crushed Oreos. This summer, hoping to start a summer tradition for my daughter, I plan to make versions with strawberries, blackberries, and, in a nod to my roots, fresh peaches. Happy cooking! 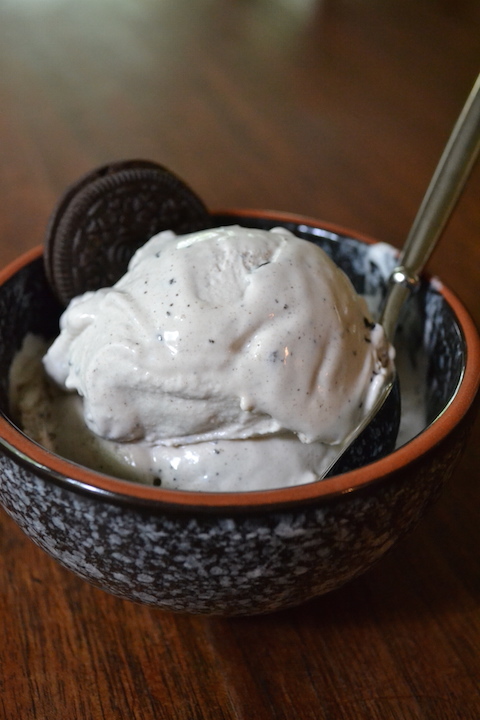 A recipe for vanilla ice cream in The Gourmet Cookbook edited by Ruth Reichl inspired the vanilla base for this recipe. While I add Oreo cookies, you can add fresh fruit, other types of cookies, nuts, or sauces like caramel or chocolate (chill sauces before adding) to the vanilla base and get equally delicious results. Heat the heavy cream, whole milk, sugar, and salt in a heavy-bottomed medium saucepan until bubbles form around the edge of the pan. Place the beaten eggs in a bowl and slowly add the cream and milk mixture, whisking constantly. Return the mixture to the saucepan and heat over medium heat, stirring constantly with a rubber spatula (be sure to scrape the sides of the pan), until the temperature reaches 170 to 175 degrees and the custard begins to thicken. Pour the custard through a fine mesh strainer. Add the vanilla extract. Cool to room temperature, stirring often. Refrigerate, covered, until very cold – at least three hours. Freeze according to your ice cream maker instructions. 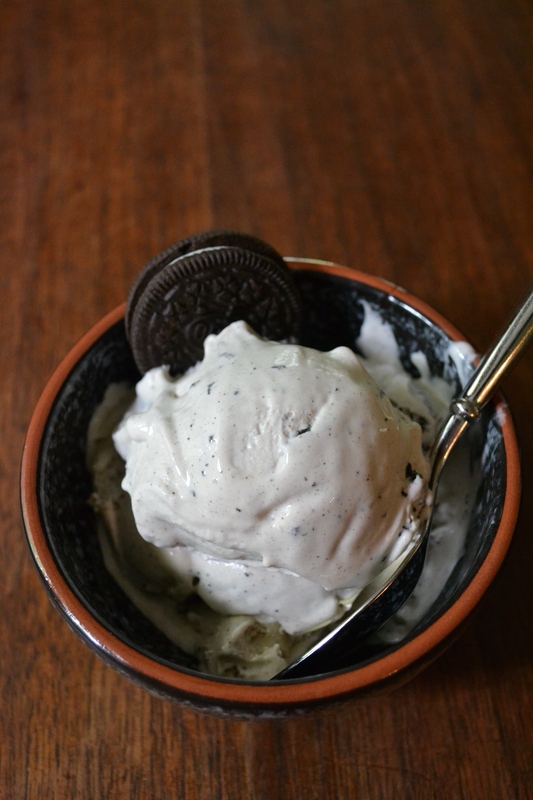 When ice cream is almost frozen, add the Oreo pieces while the ice cream maker is running. Once everything is mixed together turn off the ice cream maker and freeze in an airtight container until ready to serve. 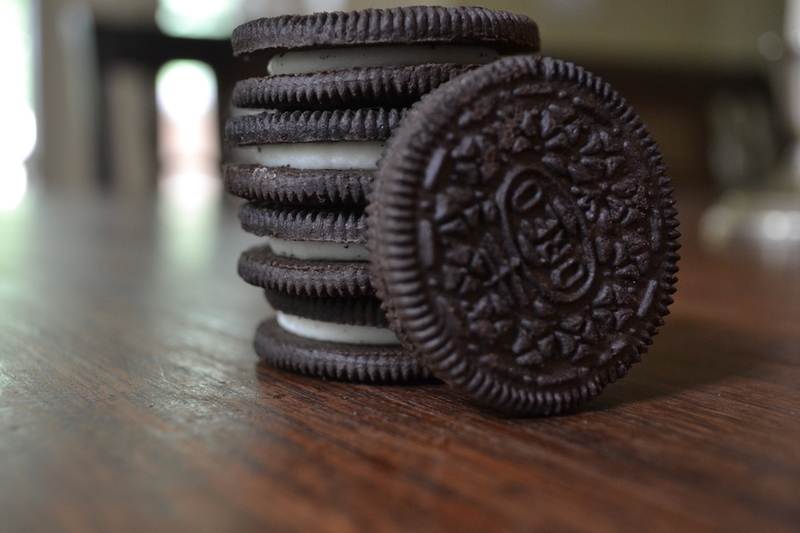 I am coming for my cookies and cream soon! This is one of my favorites. Wow. Sounds awesome.